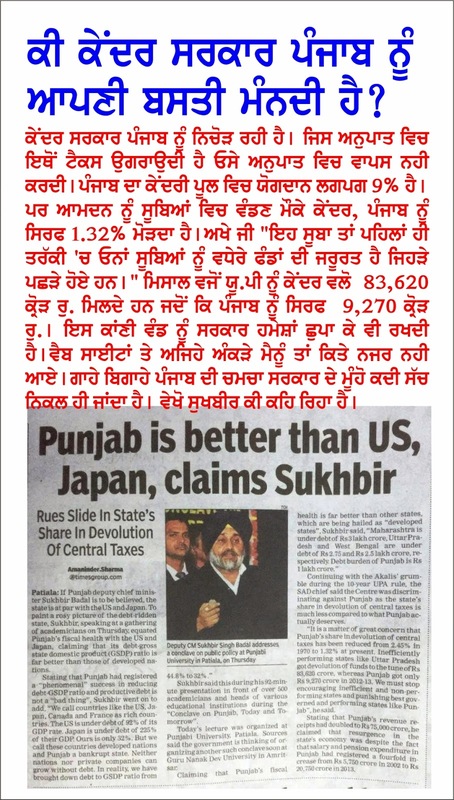 PATIALA: If Punjab deputy chief minister Sukhbir Badal is to be believed, the state is at par with the US and Japan. To paint a rosy picture of the debt-ridden state, Sukhbir, speaking at a gathering of academicians on Thursday, equated Punjab's fiscal health with the US and Japan, claiming that its debt-gross state domestic product (GSDP) ratio is far better than those of developed nations. Stating that Punjab had registered a "phenomenal" success in reducing debt-GSDP ratio and productive debt is not a "bad thing", Sukhbir went on to add, "We call countries like the US, Japan, Canada and France as rich countries. The US is under debt of 92% of its GDP rate. Japan is under debt of 225% of their GDP. Ours is only 32%. But we call these countries developed nations and Punjab a bankrupt state. Neither nations nor private companies can grow without debt. In reality, we have brought down debt to GSDP ratio from 44.8% to 32%." Sukhbir said this during his 92-minute presentation in front of over 500 academicians and heads of various educational institutions during the "Conclave on Punjab, Today and Tomorrow". Today's lecture was organized at Punjabi University, Patiala. Sources said the government is thinking of organizing another such conclave soon at Guru Nanak Dev University, Amritsar. Claiming that Punjab's fiscal health is far better than other states, which are being hailed as "developed states", Sukhbir said, "Maharashtra is under debt of Rs 3 lakh crore, Uttar Pradesh and West Bengal are under debt of Rs 2.75 and Rs 2.5 lakh crore, respectively. Debt burden of Punjab is Rs 1 lakh crore." Continuing with the Akalis' grumble during the 10-year UPA rule, the SAD chief said the Centre was discriminating against Punjab as the state's share in devolution of central taxes is much less compared to what Punjab actually deserves. "It is a matter of great concern that Punjab's share in devolution of central taxes has been reduced from 2.45% in 1970 to 1.32% at present. Inefficiently performing states like Uttar Pradesh got devolution of funds to the tune of Rs 83,620 crore, whereas Punjab got only Rs 9,270 crore in 2012-13. We must stop encouraging inefficient and non-performing states and punishing best governed and performing states like Punjab", he said. Stating that Punjab's revenue receipts had doubled to Rs 75,000 crore, he said resurgence in state's economy was despite the fact that salary and pension expenditure in Punjab had registered a fourfold increase from Rs 5,750 crore in 2002 to Rs 20,750 crore in 2013.